Taken during our trip to New Orleans for the Barbie Convention. 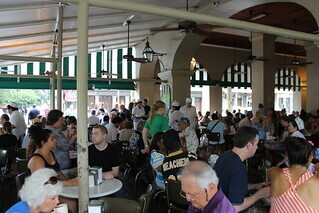 Cafe Du Monde is located right off Jackson Square on Decatur Street in the French Quarter. It is also known as the original French Market Coffee Stand. This famous coffee stand is open 24 hours a day - though we only went there in the morning. They have a few different varieties of coffee (most famously with chickory added to the roast) and one food - French-style beignets that are served with lots of powdered sugar. The Coffee au Lait is really excellent. When you go to New Orleans, everyone, and I mean everyone, will tell you to go there. It is really great.